Calling all Biggest Loser fans and anyone wanting a jump start or kick in the motivation! 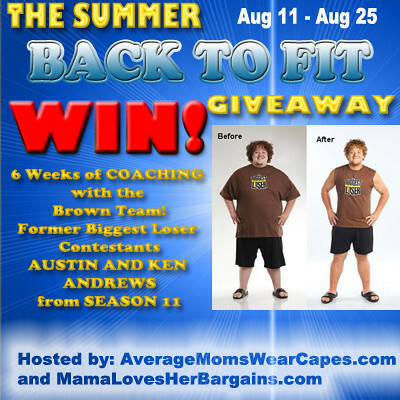 We're taking part in the Summer Back to Fit Giveaway hosted by Average Moms Wear Capes and This Mama Loves Her Bargains! Are you serious about getting back in shape, losing a few pounds and in serious need of support? Get personalized support from Former Biggest Loser Season 11 Contestants Austin Andrews and his dad, Ken from the Brown Team!! We're giving away 8 exclusive spaces for their next 6 week coaching session that starts in September! The value is $150 per person. The whole package for 8 people is worth $1200, so get your family and your friends to enter too! During the 6 weeks, you'll receive: -Personal coaching from Austin and Ken to keep you on the right track -Personal support and guidance in your weight-loss and fitness endeavors and goals -Weekly Google+ hangouts and emails with Austin and Ken -Tools from the Biggest Loser Ranch, including exclusive recipes and tips -Infinite valuable support! The last group they coached lost an average of 2% in just 6 weeks, which is fabulous! The next session begins at the end of September. This giveaway runs from August 11-August 25. Disclosure: I was not compensated for this post. All opinions are my own. Health, Beauty, Children and Family is not responsible for prize fulfillment.